If opposition supporters are wearied by the CNRP’s continuing boycott of parliament, they refused to show it on Friday as an estimated 25,000 people turned out for the final day of a three-day protest that delivered petitions and letters to eight foreign embassies and the U.N., seeking help to end the political deadlock. On Thursday, the opposition’s lackluster march attracted only about 1,000 participants as the CNRP handed petitions to the U.S., U.K. and French embassies. But, on Friday, tens of thousands of people gathered at Freedom Park before setting off at about 8:30 a.m. on a punishing trek that lasted almost six hours, crisscrossing the city in the blistering heat to visit the embassies of Australia, Russia, Japan, Indonesia and China, with the police presence minimal for the third successive day. The embassies visited represent countries that signed the 1991 Paris Peace Agreement 22 years ago on Wednesday, which ushered in a U.N.-led election following years of civil war, and held open the promise of a peaceful, multiparty democracy. With Prime Minister Hun Sen’s ruling CPP governing despite the boycott of parliament by the 55 elected opposition lawmakers, and with no proper investigation of July’s election carried out, the CNRP says that the terms of the 1991 agreement had been broken. Signatories to the agreement, the CNRP says, still have a duty to ensure that the Cambodian government adheres to the agreement’s core principle of a liberal and participatory democracy. Though it is unlikely that the international community will act—most of the countries whose embassies were visited on Friday have en­dorsed the CPP’s election victory—the opposition and its supporters re­main indefatigable in their attempts to force the government to soften its intransigent stance. Despite the rising heat, the huge crowd was in jubilant spirits as the march reached the Australian Embassy on National Assembly Street, the first stop of the day’s itinerary. The crowd surged around the embassy entrance as it opened to admit opposition leaders Kem Sokha and Sam Rainsy to deliver their petition letter. 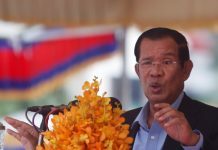 Newly elected Australian Prime Minister Tony Abbott sent Prime Minister Hun Sen a letter on October 6 congratulating him on his election win and his reappointment as prime minister. But after exiting the embassy, Mr. Rainsy told the cheering crowd that the Australian ambassador, Alison Burrows, had just told him that the Australian government does not recognize the July 28 national election result and does not recognize Mr. Hun Sen’s government. “The ambassador said that Australia recognizes Cambodia as a state but has not recognized any particular government or any particular election—especially the recent election,” Mr. Rainsy said, while Mr. Sokha added that the Australian Embassy wants what the Cambo­dian people want: democracy. A short walk away, Mr. Rainsy and Mr. Sokha were met at the rear entrance gates of the Russian Embassy, which has deemed the election free and fair and endorsed the CPP’s victory, where representatives informed them that the petition would be passed to the Rus­sian government. Water was continuously passed out to walkers as the sun climbed and marchers clothes became soaked through with sweat, but the chanting of “Change, Change” continued unabated as a tuk-tuk loaded with a loud speaker pumped drumbeats that maintained the momentum and created a carnival-like mood. The wide stretch of Norodom Boulevard revealed the vastness of the crowd as it headed to the Japanese Embassy, where Mr. Rainsy extolled the Japanese government’s generous contributions to Cambodia’s development and stressed its potential leverage on Mr. Hun Sen’s government. “Japan is the country that has donated more funds to Cambodia than any other country in the world and it has the capacity to push Cambodia to properly implement the Paris Peace Agreement, to respect democracy and give justice to the Cambodian agreement—and [the ambassador] agreed with our message,” Mr. Rainsy said. After handing their petition letter over to officials inside the Indo­nesian Embassy, word spread on the long walk down Mao Tse Tung Boulevard that the Chinese Em­bassy—seen by many as the CPP’s most loyal ally—would refuse to accept the CNRP’s letter. Along Mao Tse Tung, the marchers were buoyed as they passed workers who cheered and waved in support from the windows and tops of buildings under construction, while thousands more supporters lined the streets offering a guard of honor for those taking part in the march. Despite the rumors, when the marchers arrived the Chinese Embassy door opened and the opposition leaders spent 20 minutes inside the building as supporters outside took a well-earned rest and rehydrated before Mr. Rainsy and Mr. Sokha emerged back into the sunlight. “I informed the Chinese Ambassador [Bu Jianguo] that China is a friend and is loved by all Khmers and all parties and I assured [her] that we will keep the good relationship between the Communist Party and the Cambodia National Rescue Party,” he said. The last leg of the march was the long walk on Monivong Boulevard to Freedom Park, but the tens of thousands of opposition supporters took it all in their stride, and as they packed noisily into the park to hear their leaders’ closing speeches, their energy seemed undiminished. “We are extremely proud that these three days of demonstrations passed off peacefully and without violence—they have been a huge success,” Mr. Sokha told the up­roarious crowd. 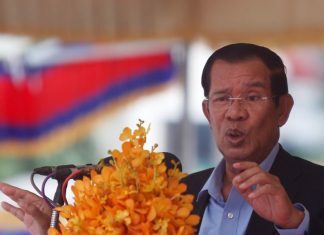 Mr. Sokha said that though the CPP believes it has an inalienable right to rule the country’s institutions, the fact was that the CNRP now has the power of the Cam­bodian people, and he vowed the CNRP would continue on its course of boycotting the National Assem­bly and holding mass demonstrations until the voice of the people is heard. “If they do not find justice for us, the next time we will hold demonstrations they will be 2 or 3 million people strong,” he said. Mr. Rainsy joined Mr. Sokha on stage to huge cheers and told the crowd that he believed some 50,000 people had participated in the march and praised their collective efforts, which he said the CPP could never hope to match. “The CPP grab poor people’s land, grab poor people’s houses, take poor people’s rice fields and destroy your forests and your livelihoods…they are like vampires, scaring us in the dark, de­frauding our votes, killing people in the shadows—theirs is the dark way,” he said, adding that the way of the CNRP is light, truth, justice and morality. 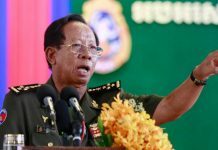 Mr. Rainsy then returned to his old bugbear, pillorying the Viet­namese—or “Yuon”—despite promising before the election he would refrain from stoking racial nationalist sentiment. With the CPP steadfast in its refusal to negotiate until the CNRP takes its seats in the National Assembly, and the CNRP equally resolute in its determination to force reform before sitting in parliament, there may be many more opportunities for CNRP supporters to “join together” in protest.